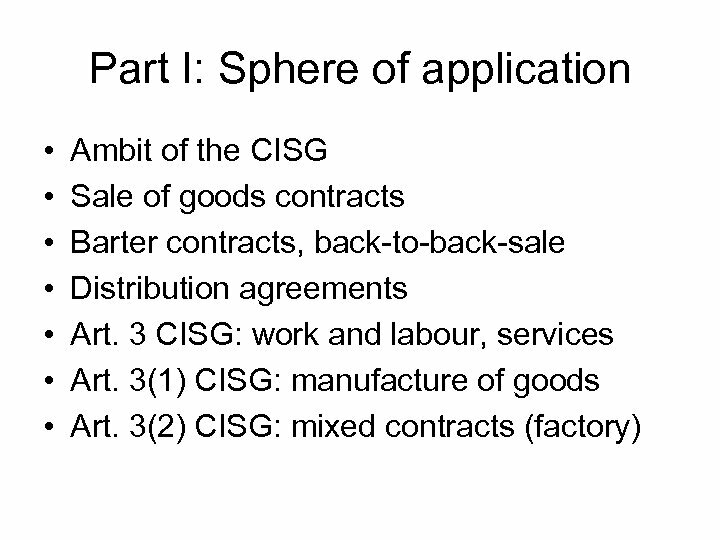 Part I: Sphere of application • Art. 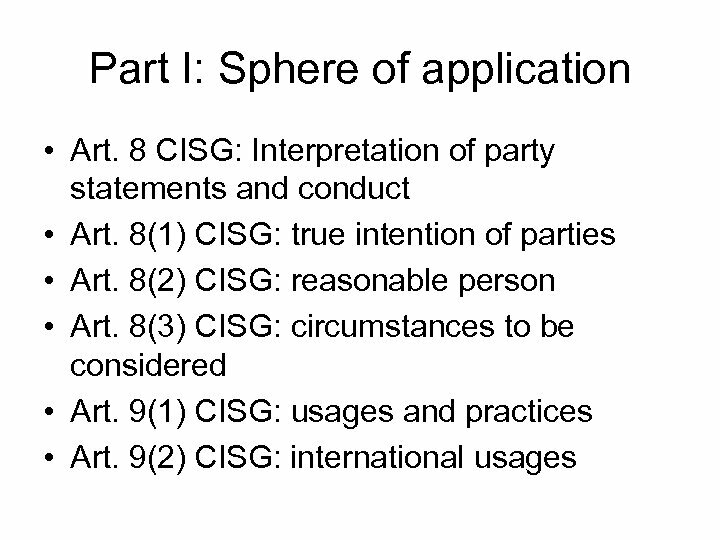 7 CISG: Interpretation of the CISG • Art. 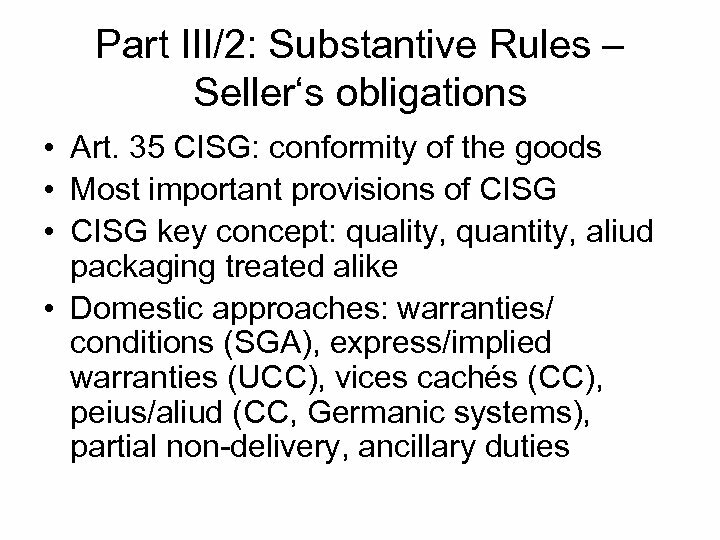 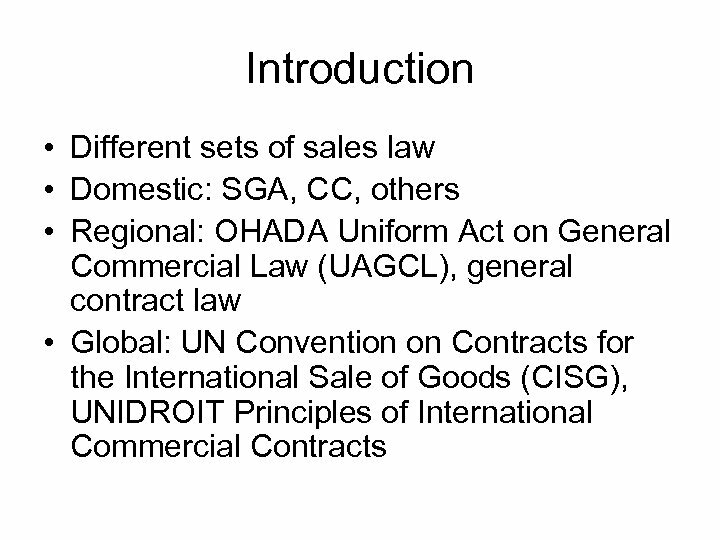 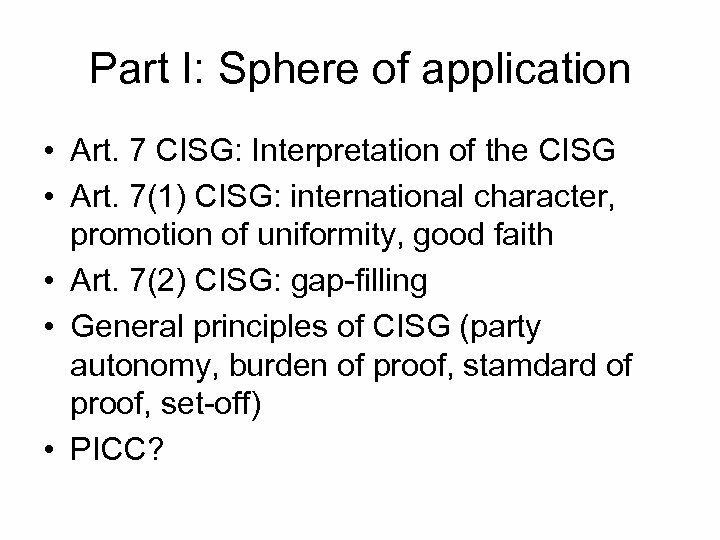 7(1) CISG: international character, promotion of uniformity, good faith • Art. 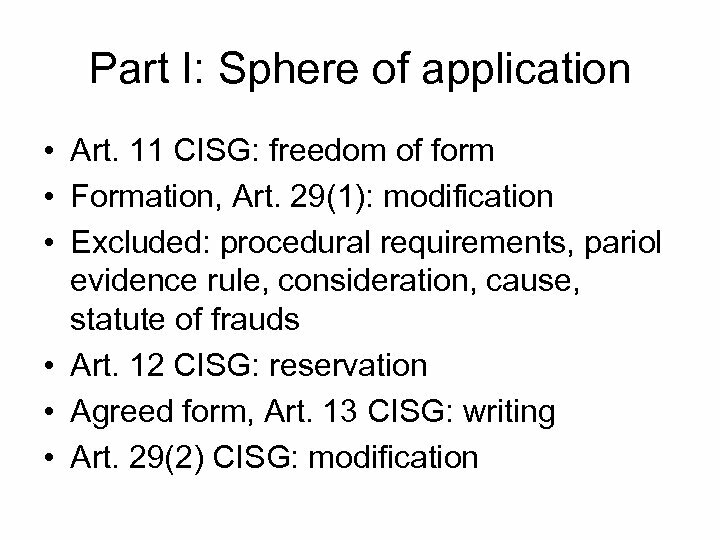 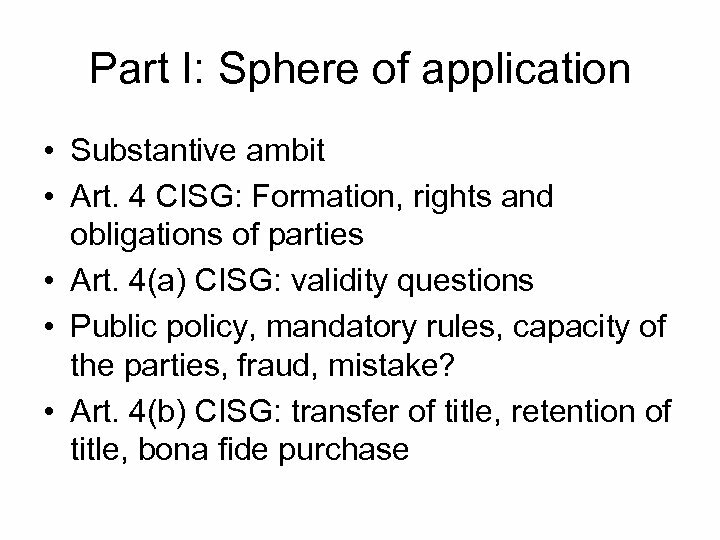 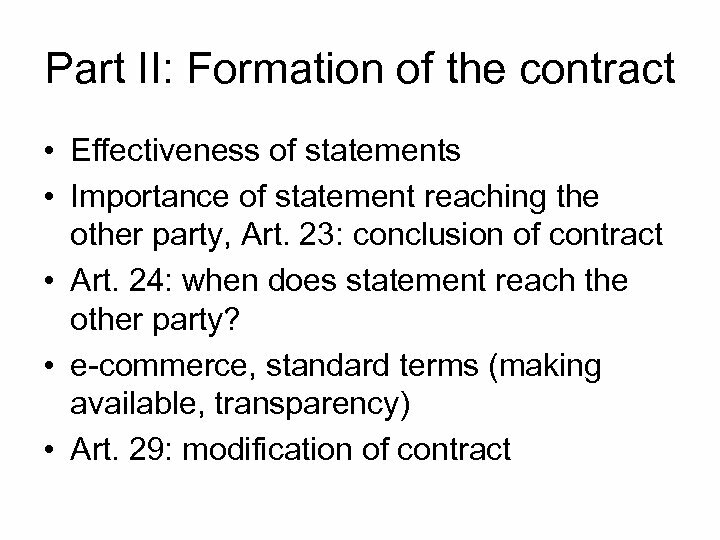 7(2) CISG: gap-filling • General principles of CISG (party autonomy, burden of proof, stamdard of proof, set-off) • PICC? 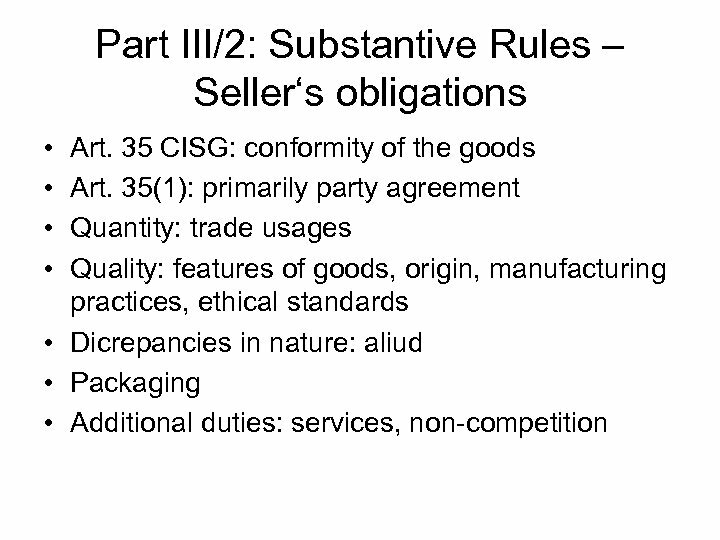 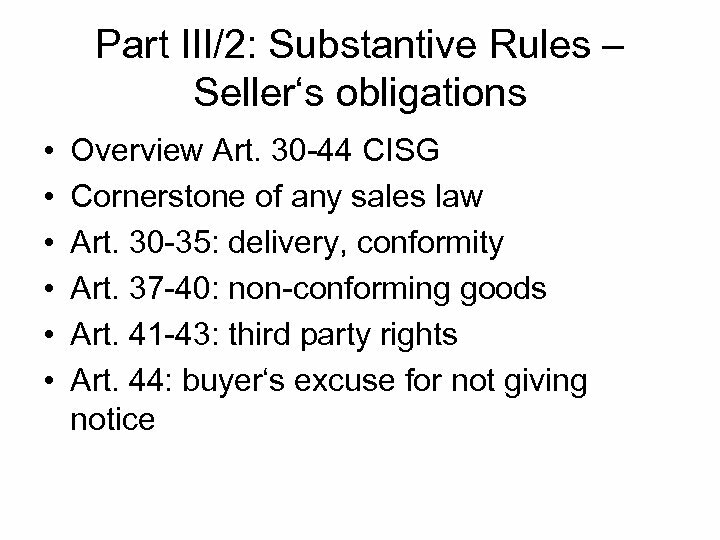 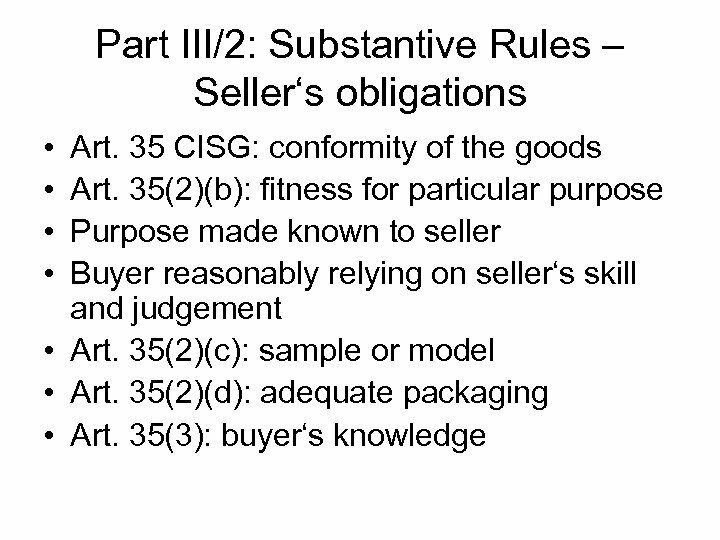 Part III/4: Substantive Rules – Buyer‘s obligations • Art. 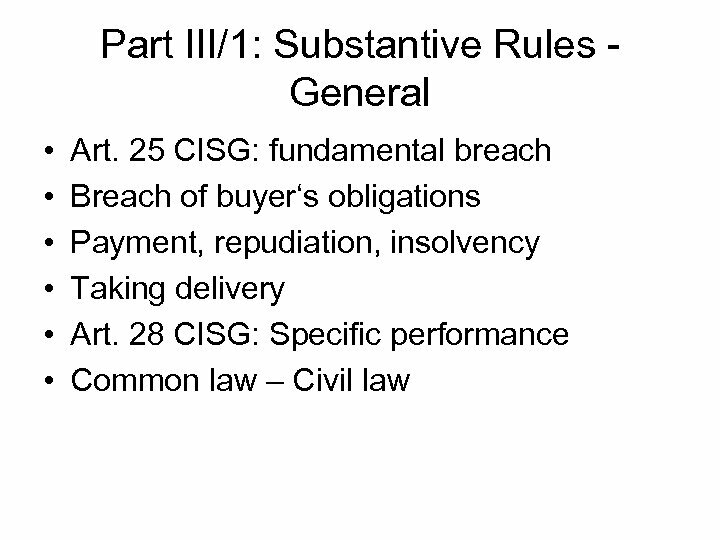 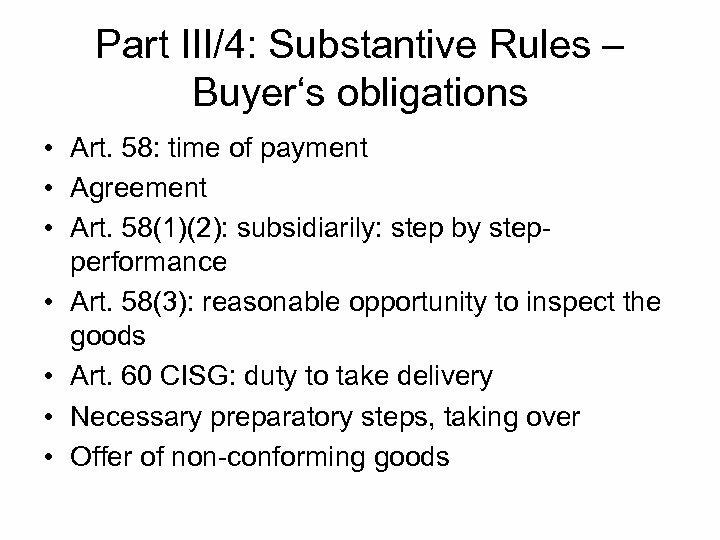 53 CISG: payment, taking delivery • Art. 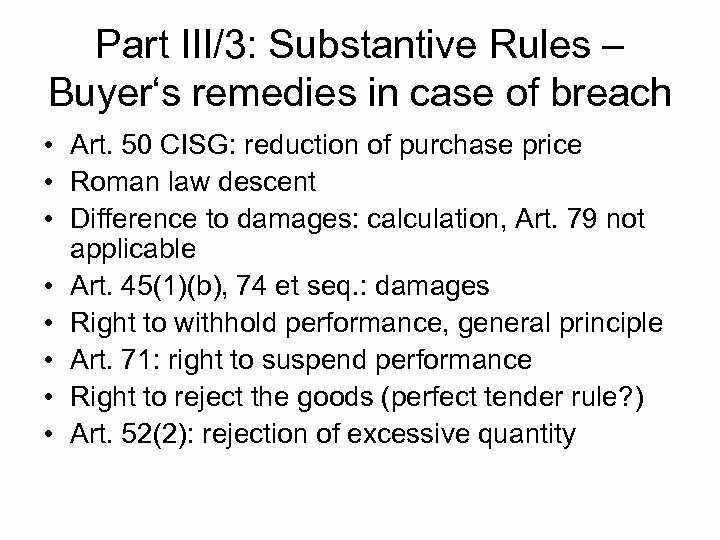 54 -59: payment of purchase price • Art. 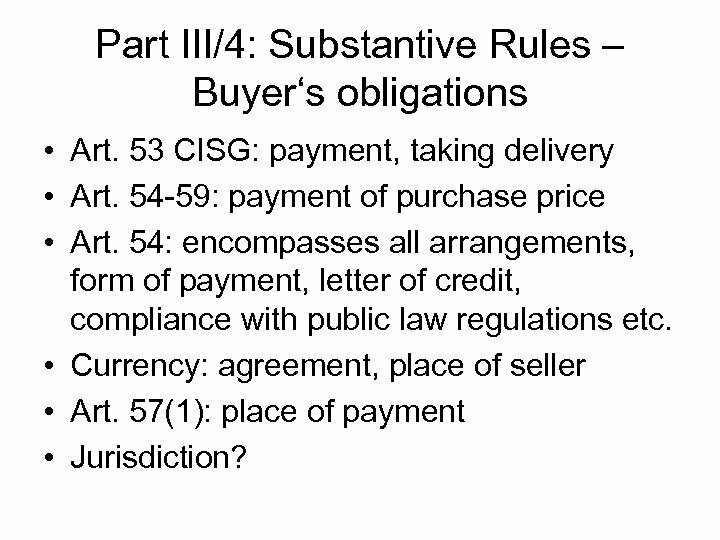 54: encompasses all arrangements, form of payment, letter of credit, compliance with public law regulations etc. 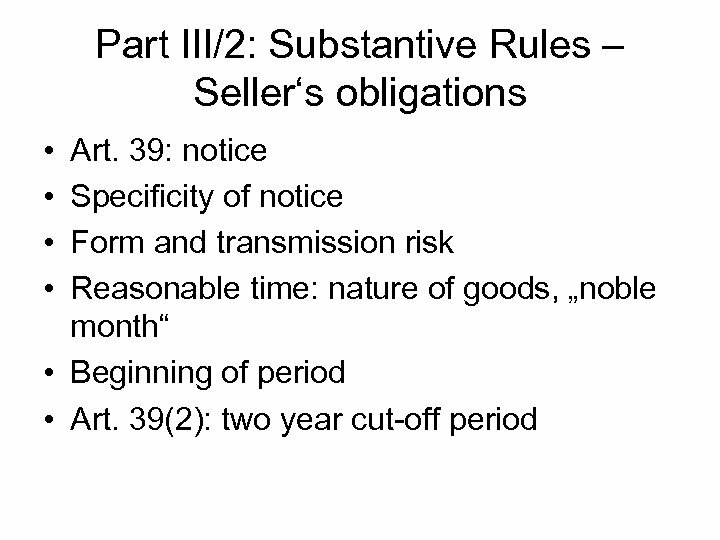 • Currency: agreement, place of seller • Art. 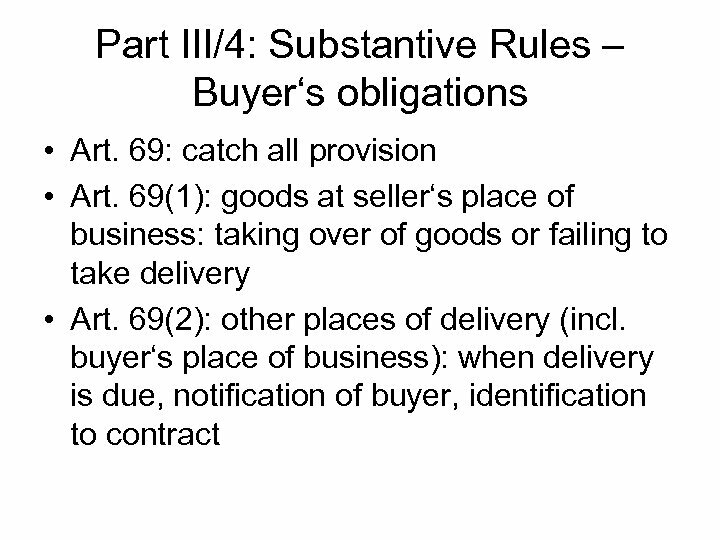 57(1): place of payment • Jurisdiction? 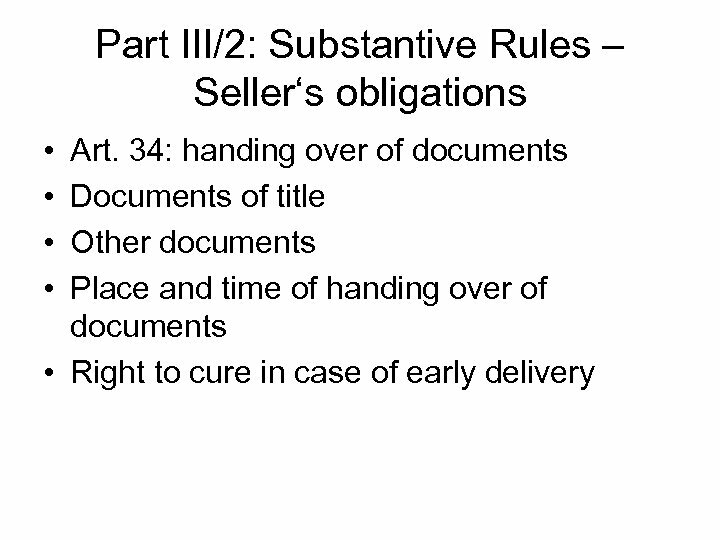 Part III/4: Substantive Rules – Buyer‘s obligations • Art. 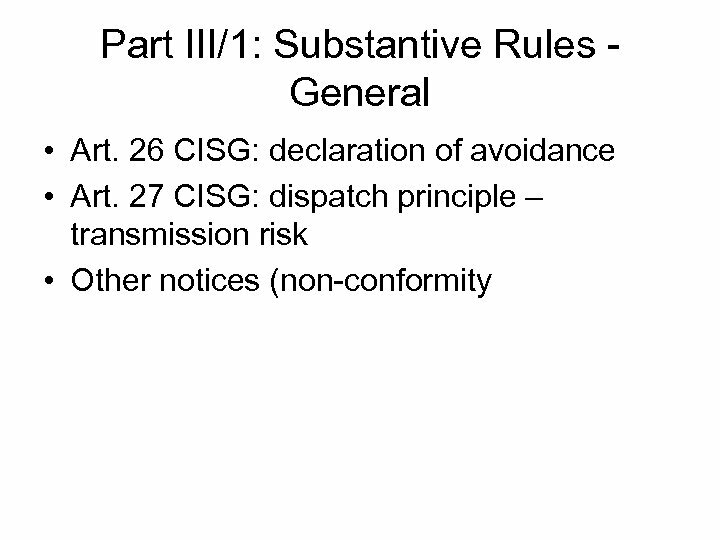 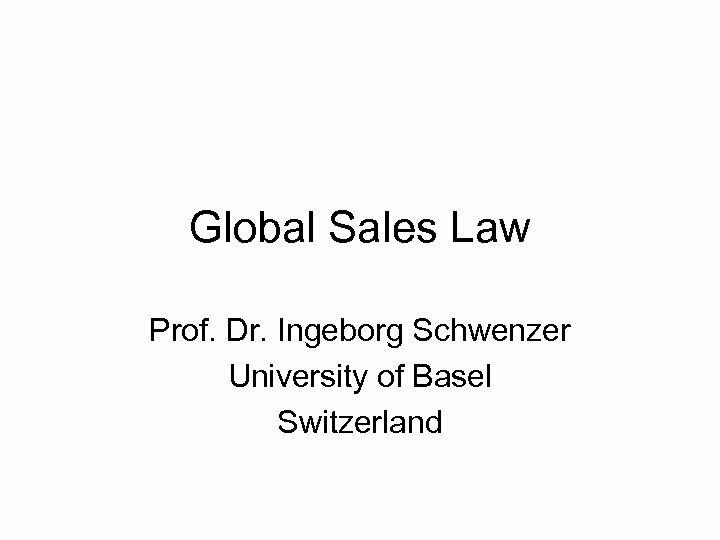 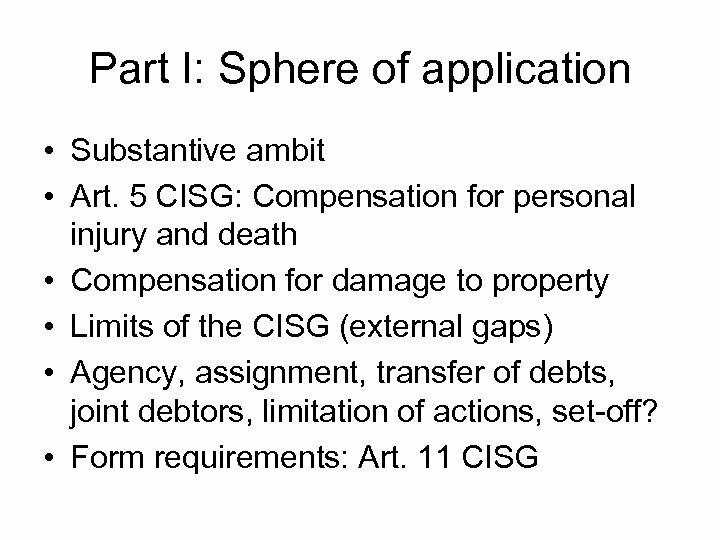 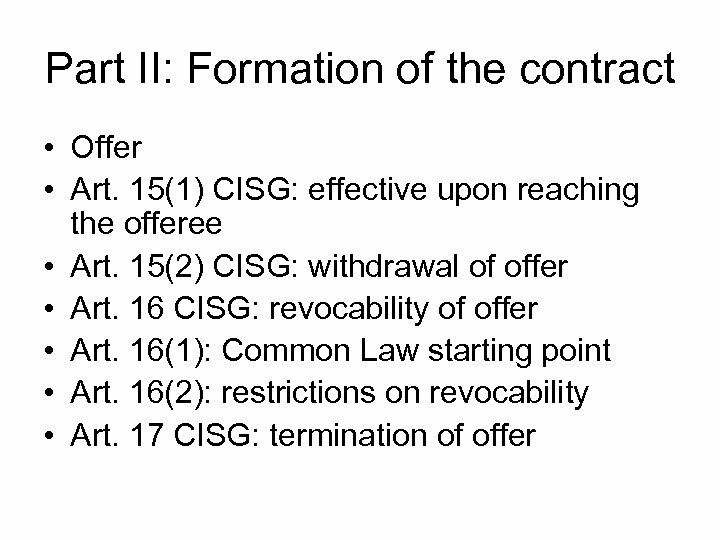 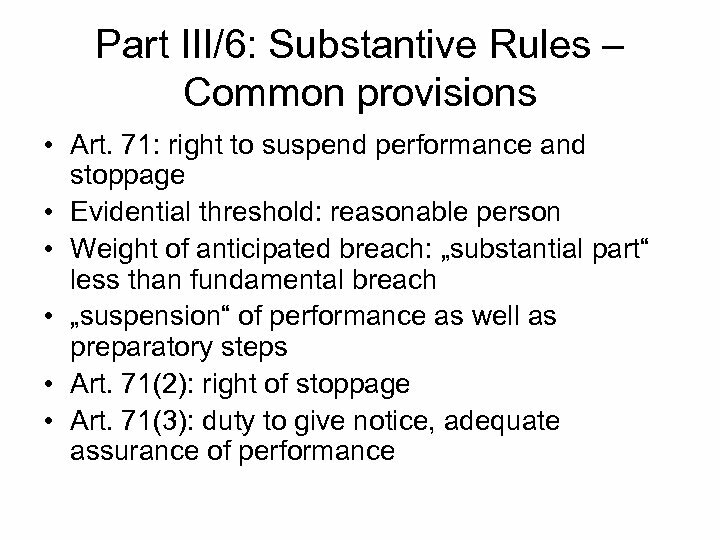 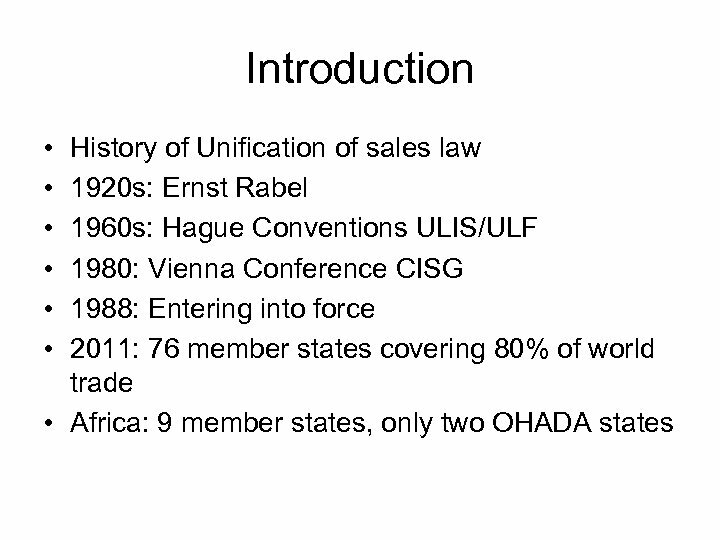 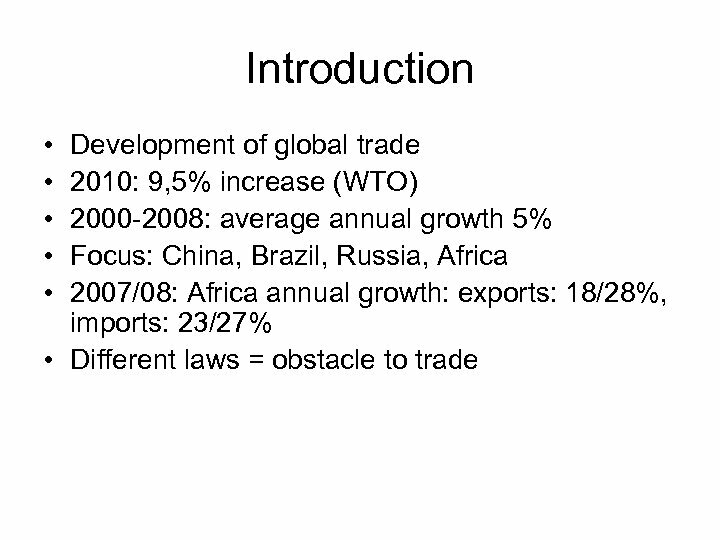 66 -70 CISG: passing of risk • Art. 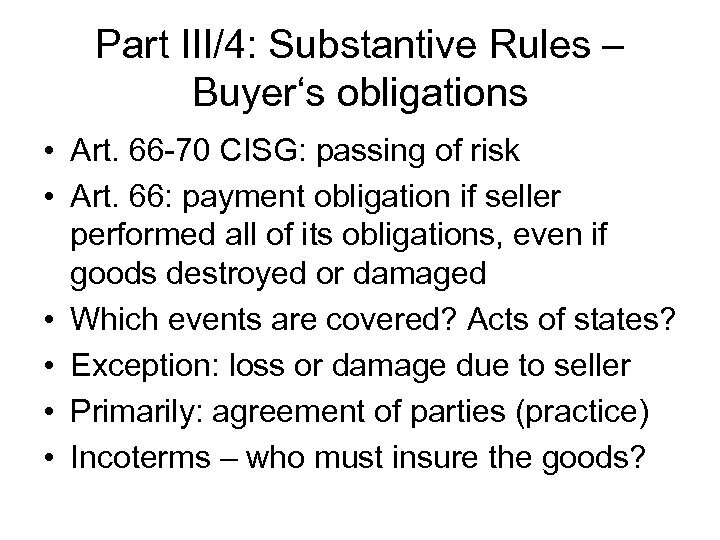 66: payment obligation if seller performed all of its obligations, even if goods destroyed or damaged • Which events are covered? 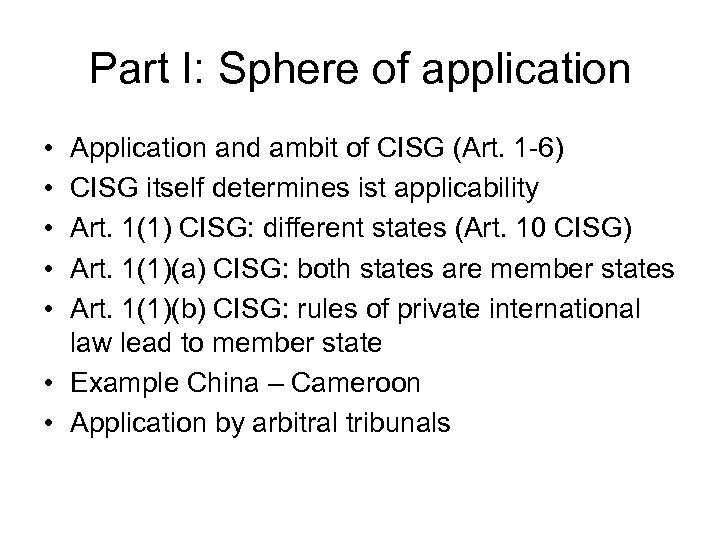 Acts of states? 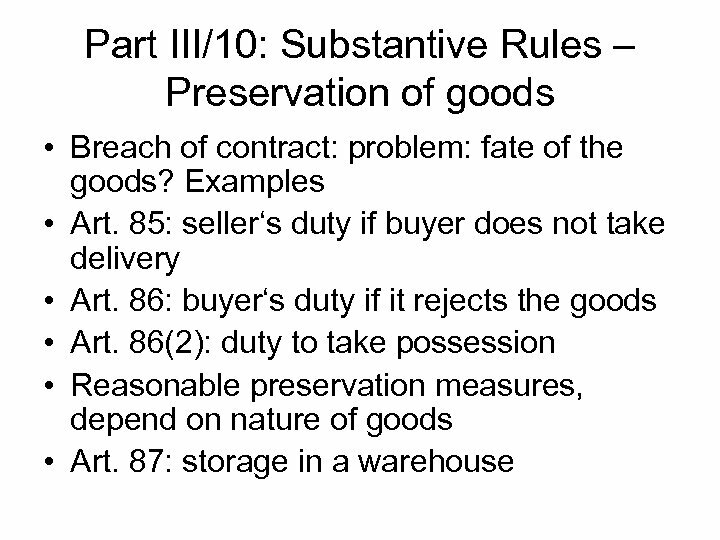 • Exception: loss or damage due to seller • Primarily: agreement of parties (practice) • Incoterms – who must insure the goods? 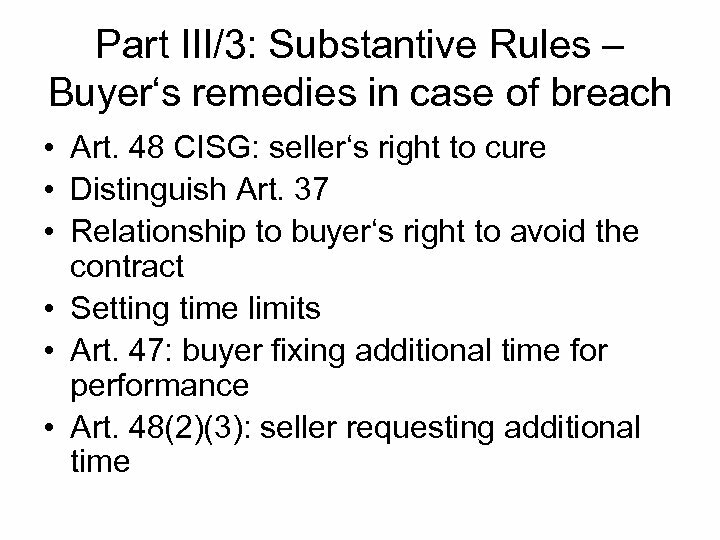 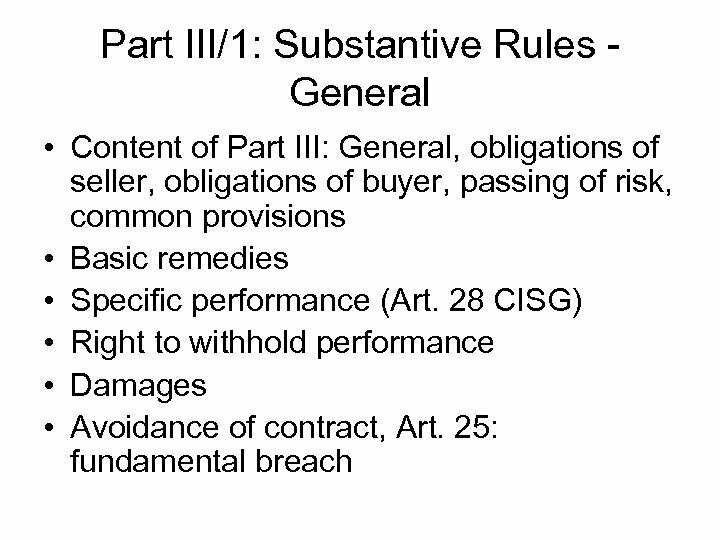 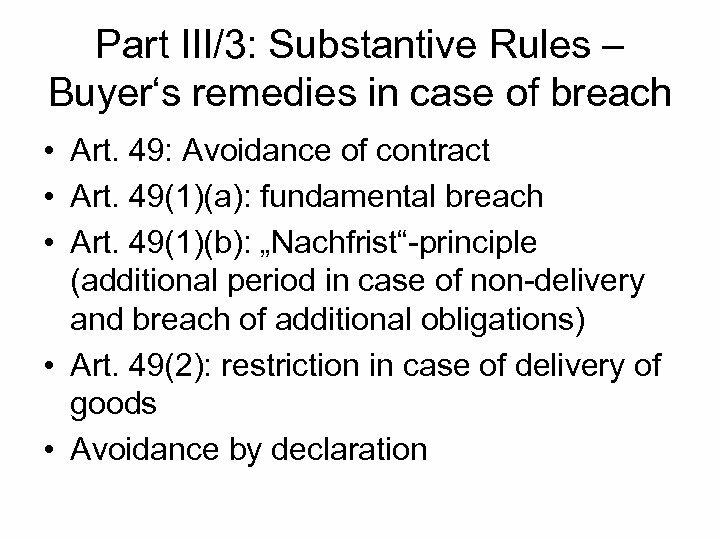 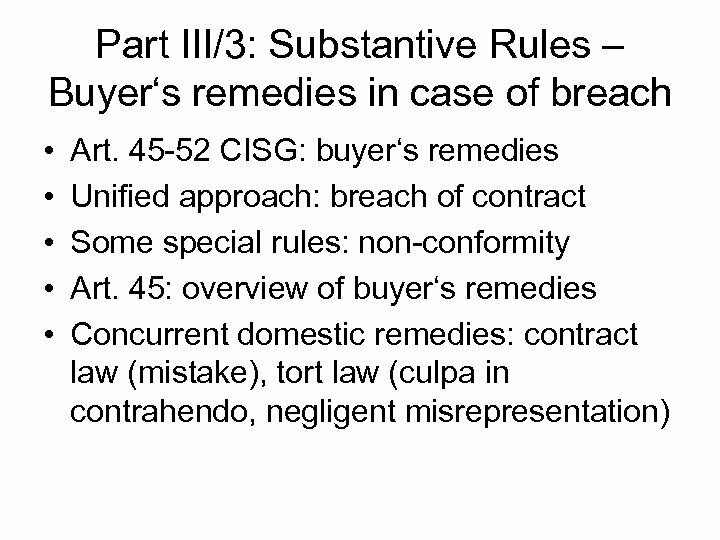 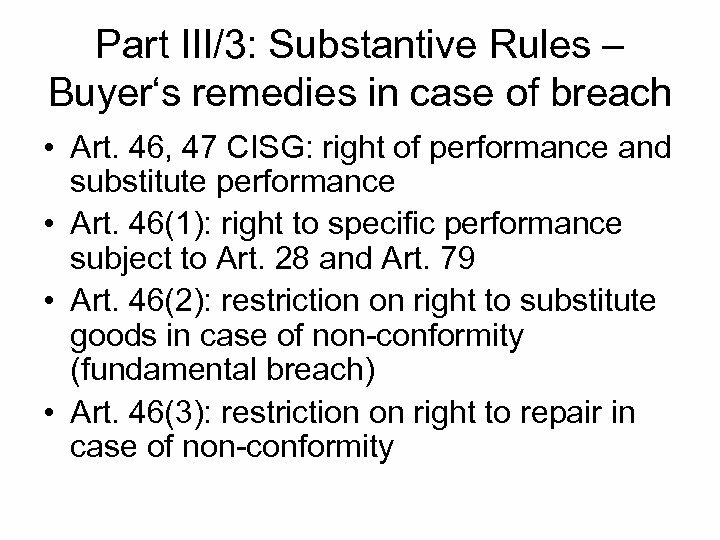 Part III/5: Substantive Rules – Seller‘s remedies in case of breach • Art. 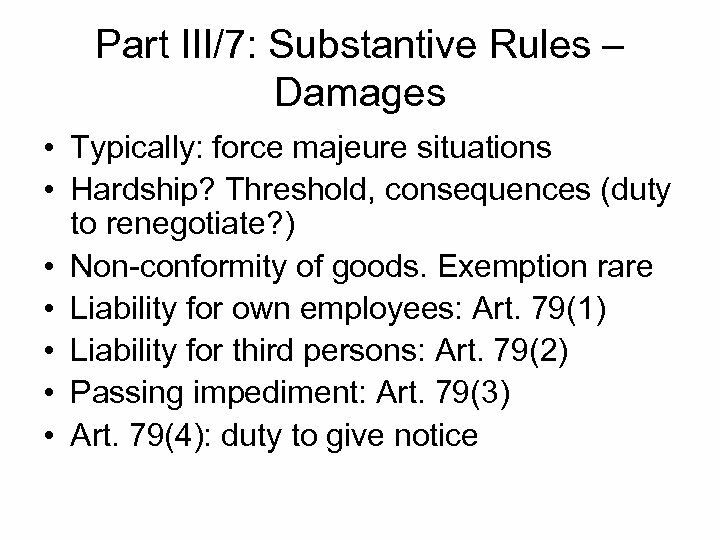 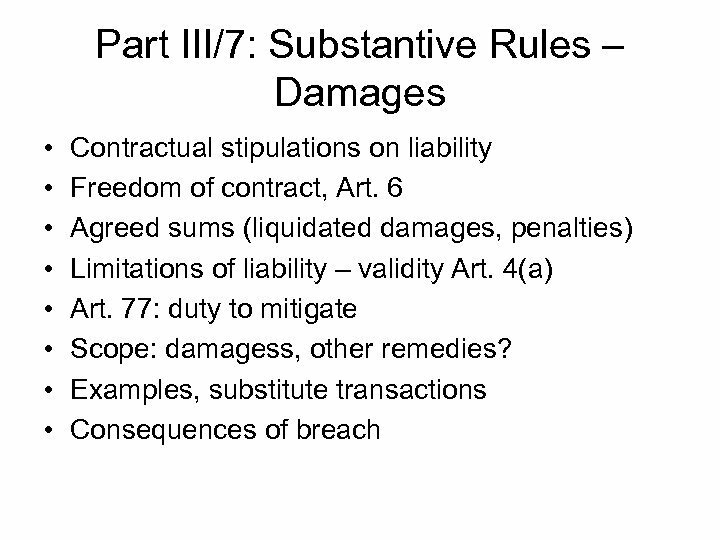 61(1)(b), 74: damages • Rights of retention: Art. 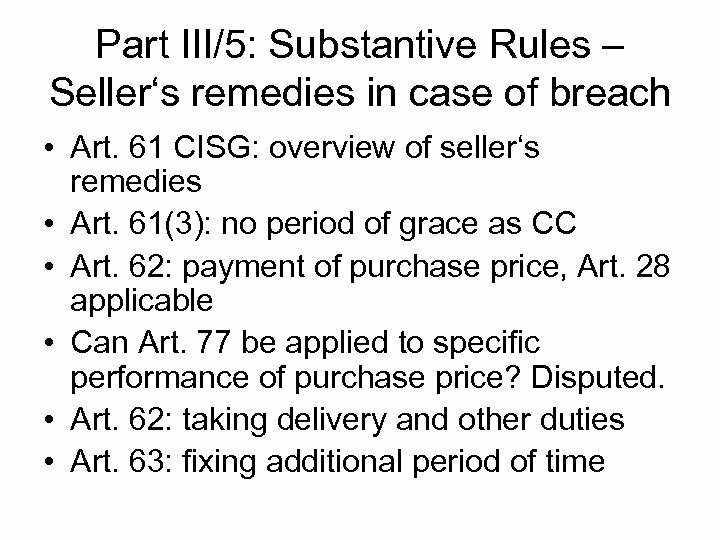 58(1): step-by-step -principle, Art. 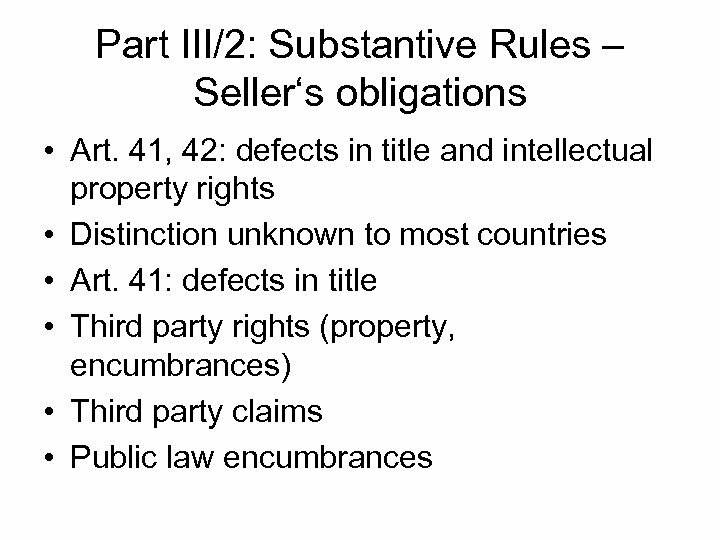 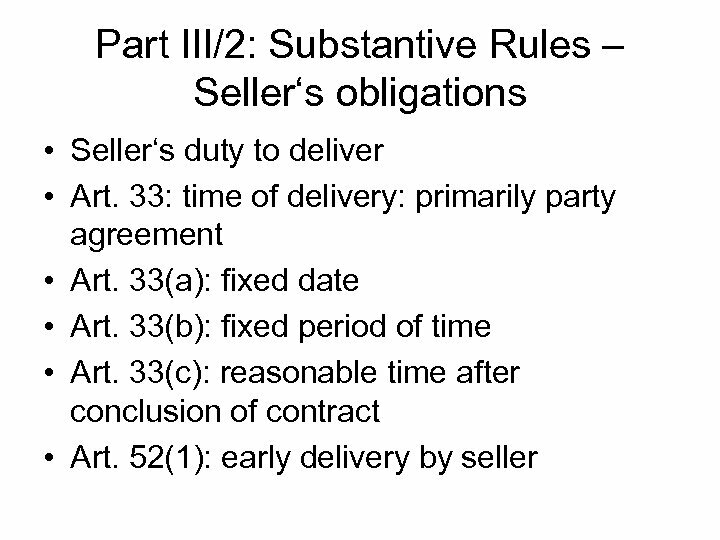 71(1): if seller must perform first, Art. 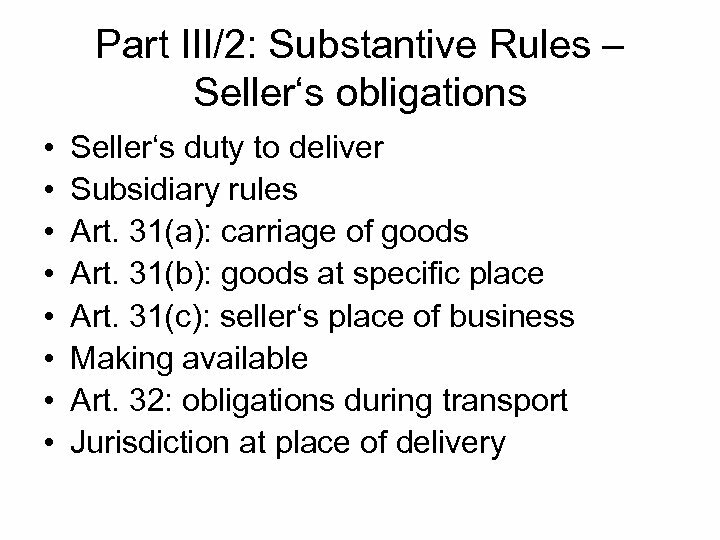 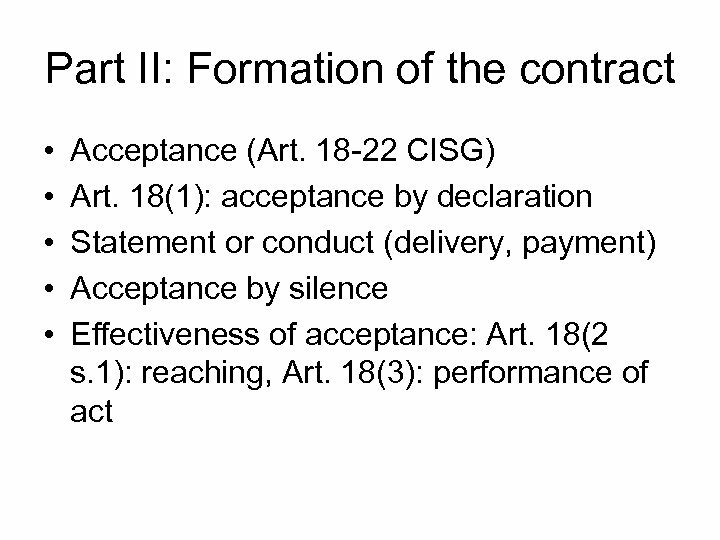 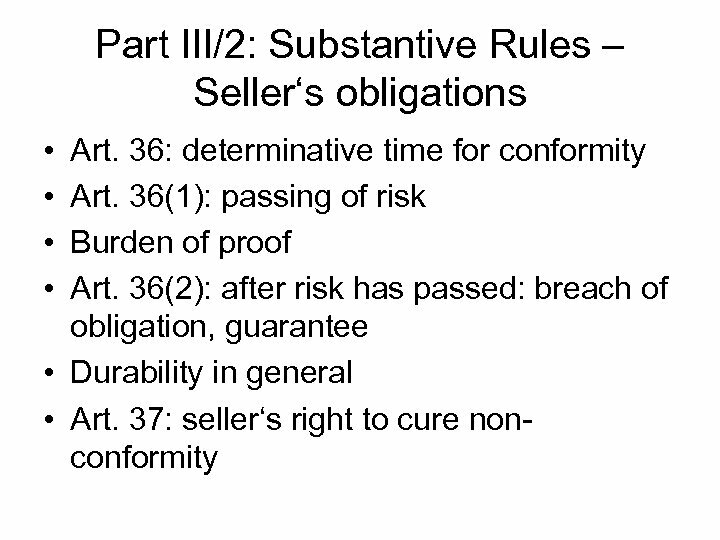 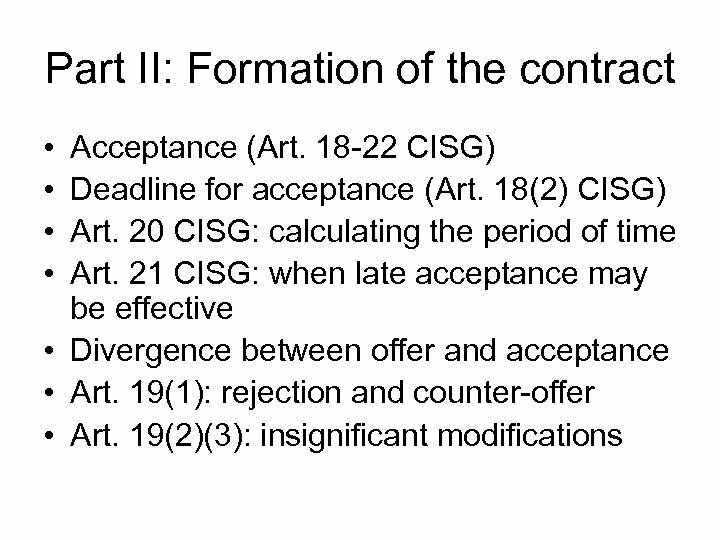 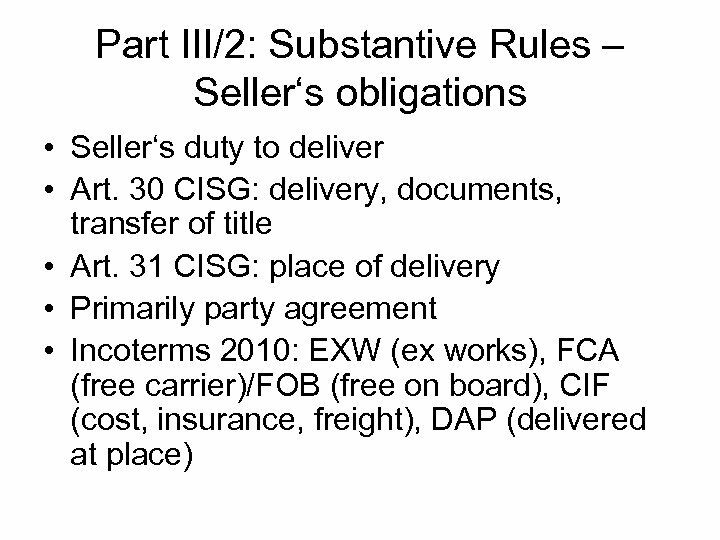 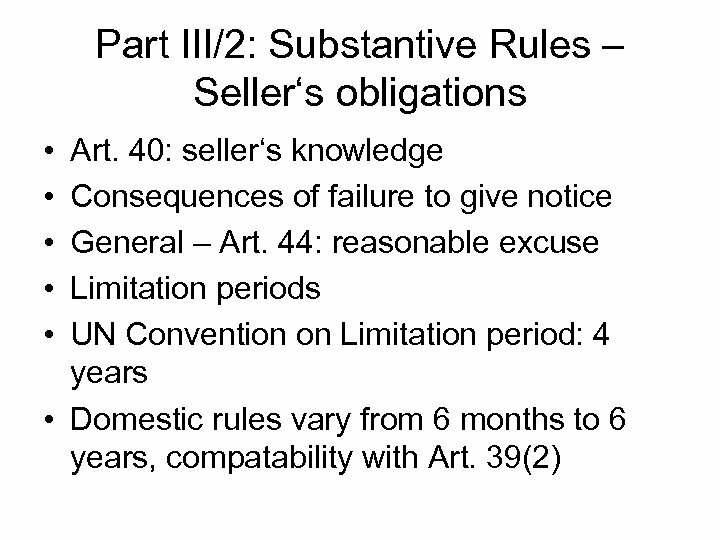 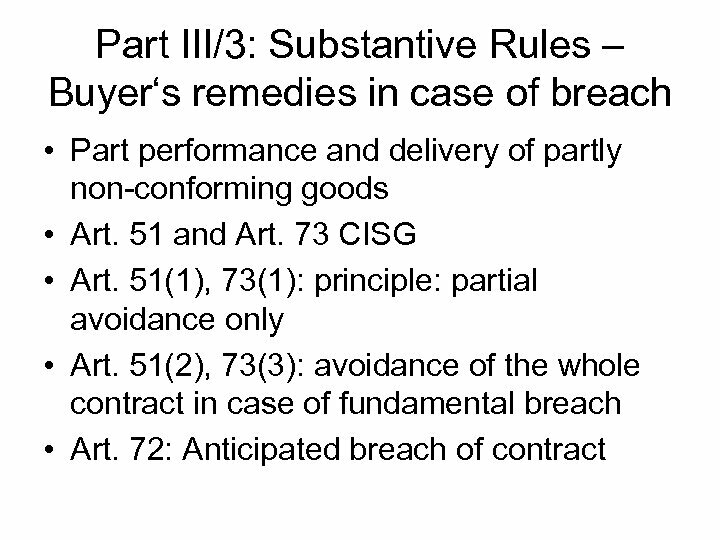 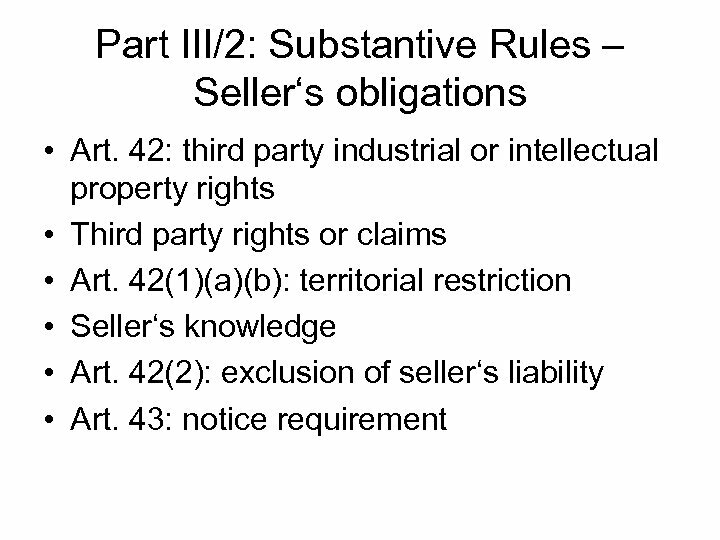 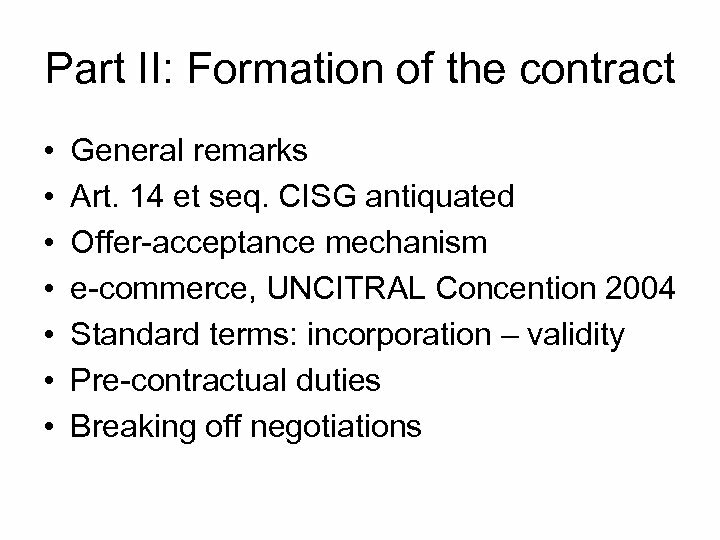 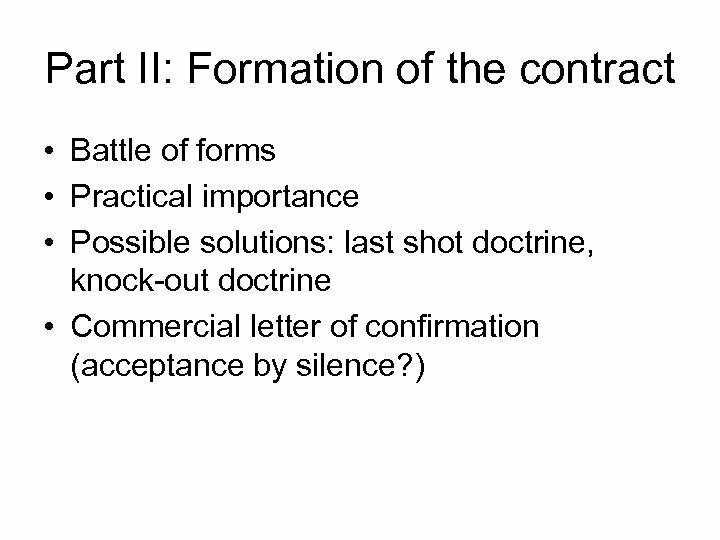 71(2): right of stoppage in transitu (does not apply against carrier) • Specification by the seller, Art. 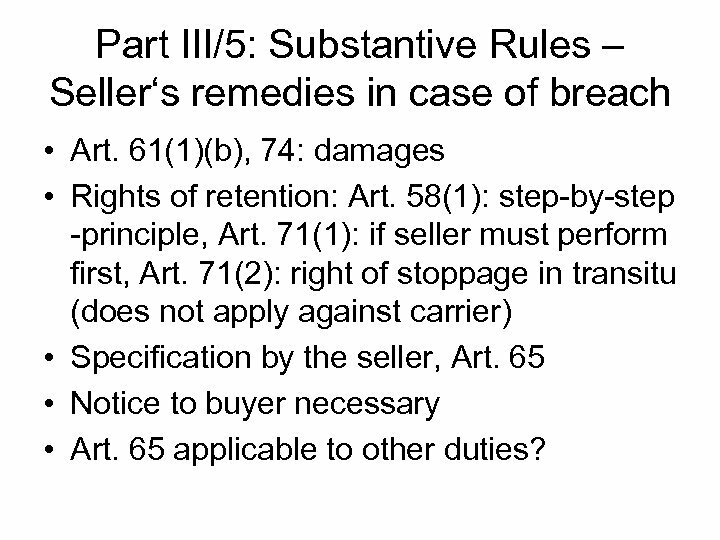 65 • Notice to buyer necessary • Art. 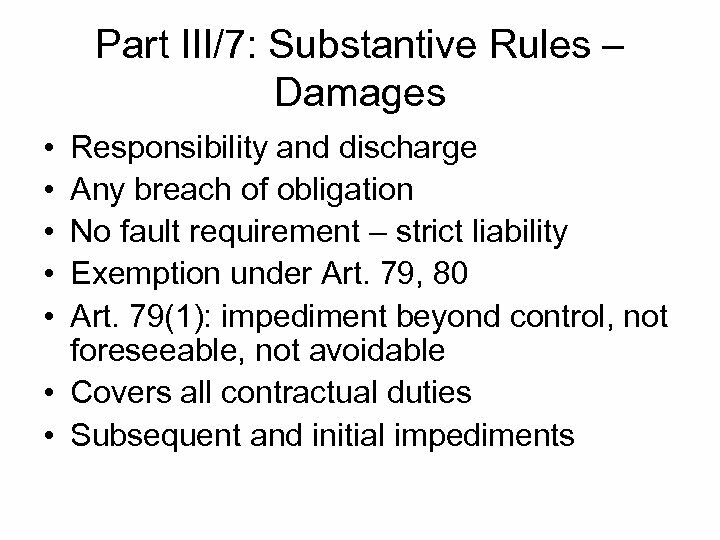 65 applicable to other duties? 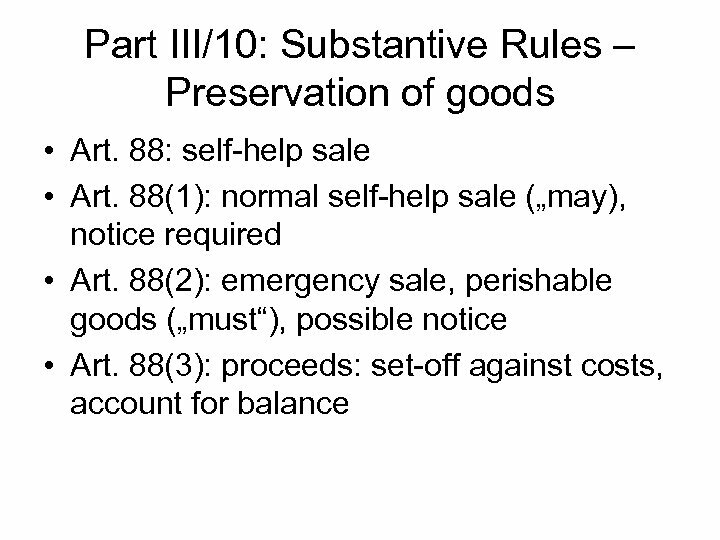 Part III/6: Substantive Rules – Common provisions • Art. 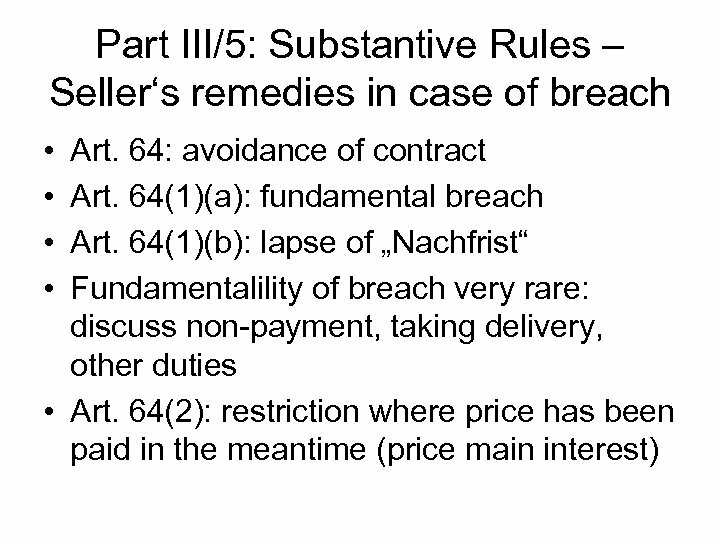 72: anticipatory breach • Repudiation by one party, demanding price adjustment, factual circumstances • Art. 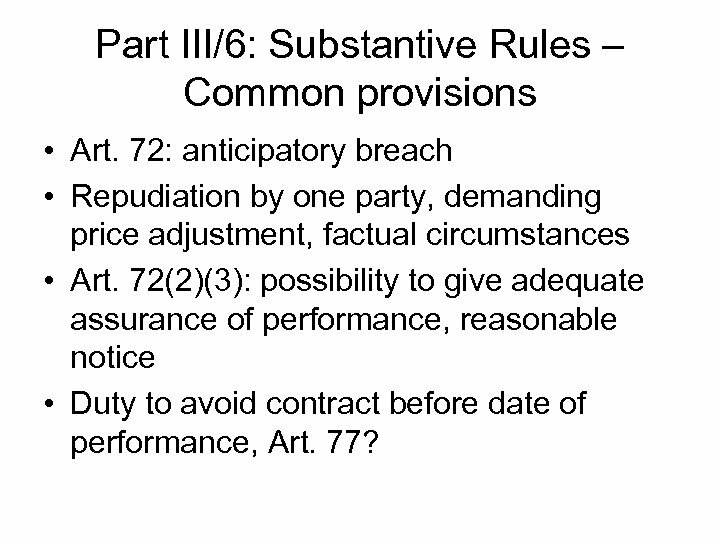 72(2)(3): possibility to give adequate assurance of performance, reasonable notice • Duty to avoid contract before date of performance, Art. 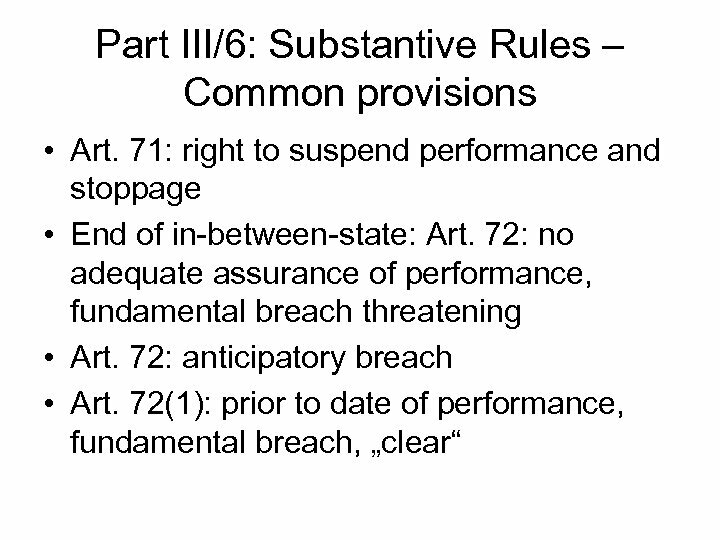 77? 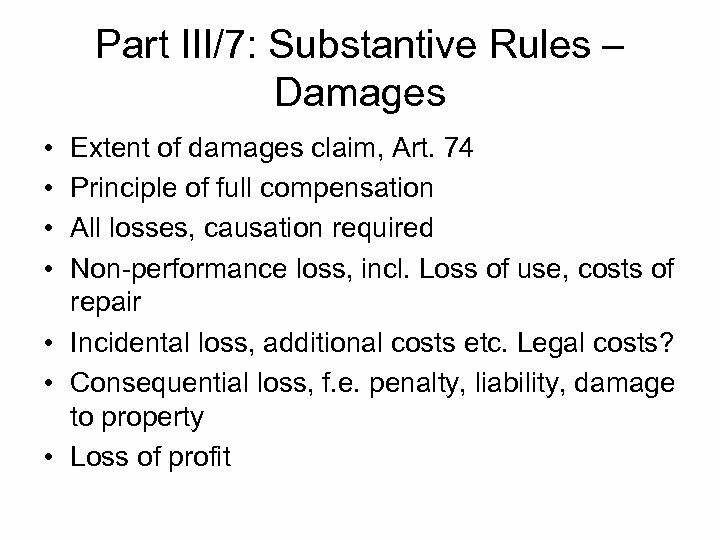 Part III/7: Substantive Rules – Damages • Art. 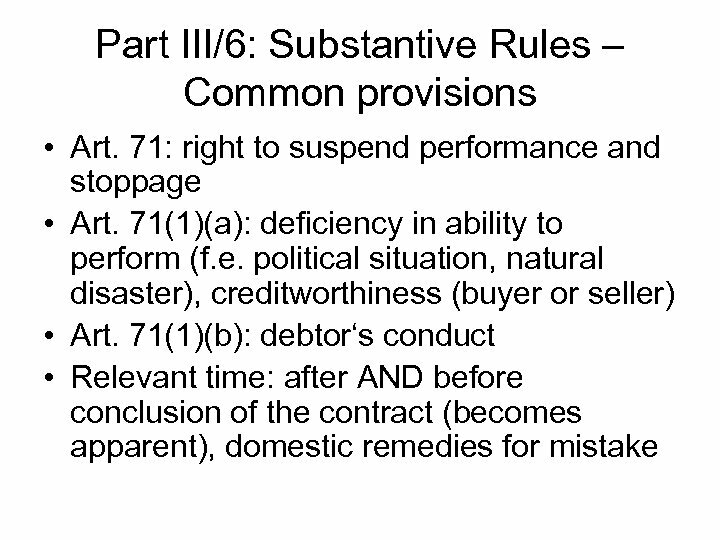 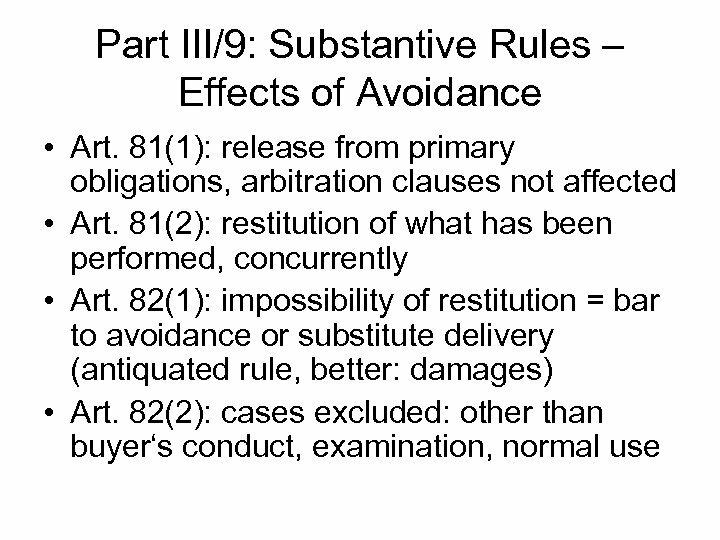 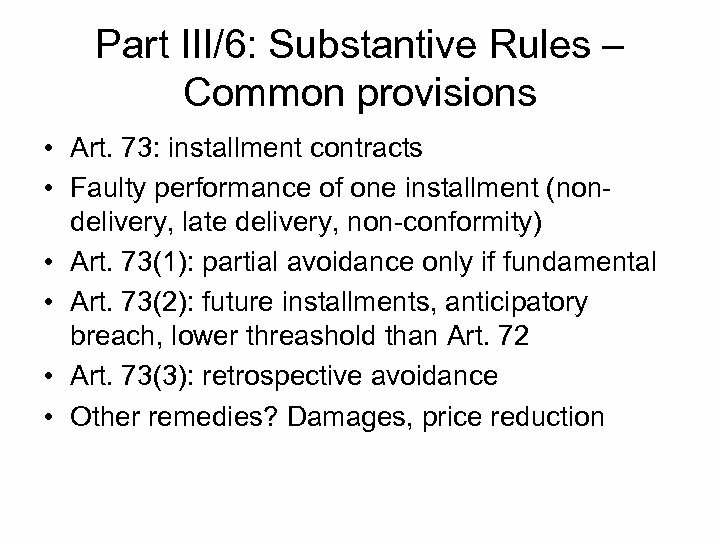 79(5): other remedies: withholding performance, avoidance, reduction of price, specific performance? 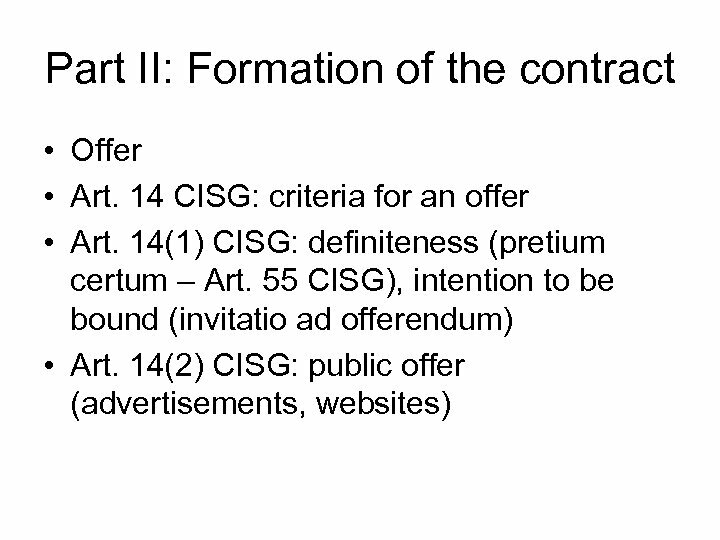 • Art. 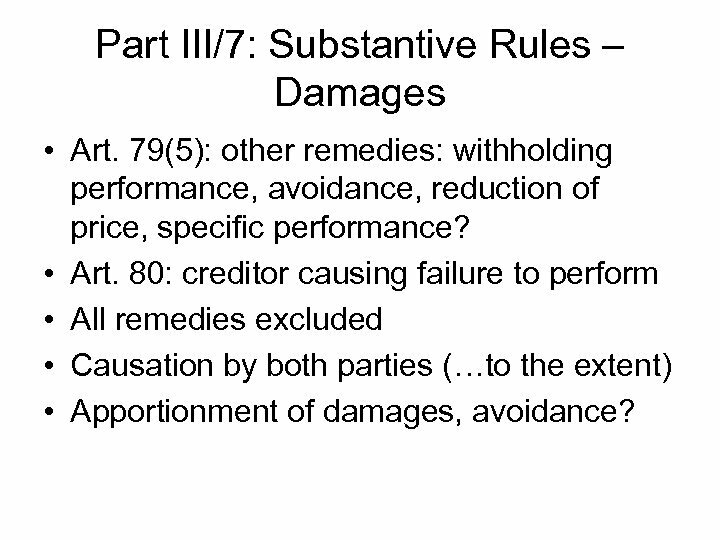 80: creditor causing failure to perform • All remedies excluded • Causation by both parties (…to the extent) • Apportionment of damages, avoidance? 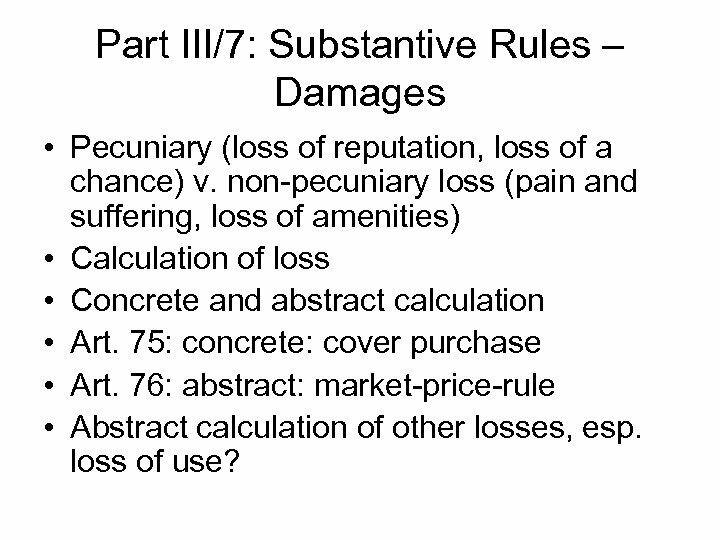 Part III/7: Substantive Rules – Damages • Pecuniary (loss of reputation, loss of a chance) v. non-pecuniary loss (pain and suffering, loss of amenities) • Calculation of loss • Concrete and abstract calculation • Art. 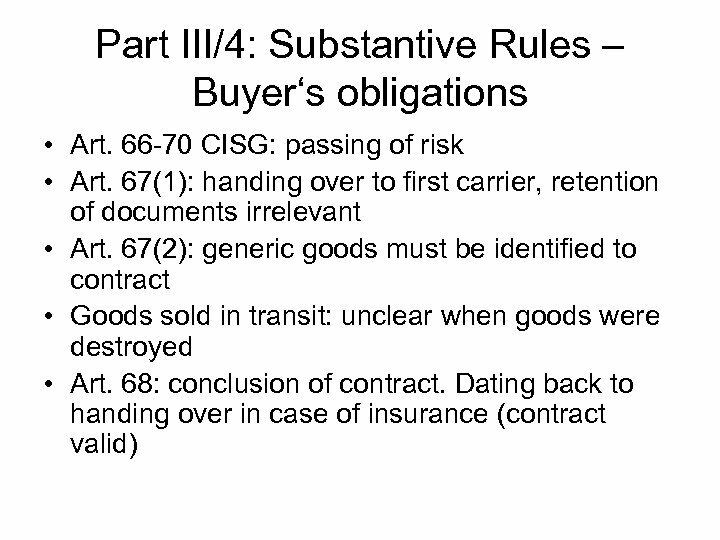 75: concrete: cover purchase • Art. 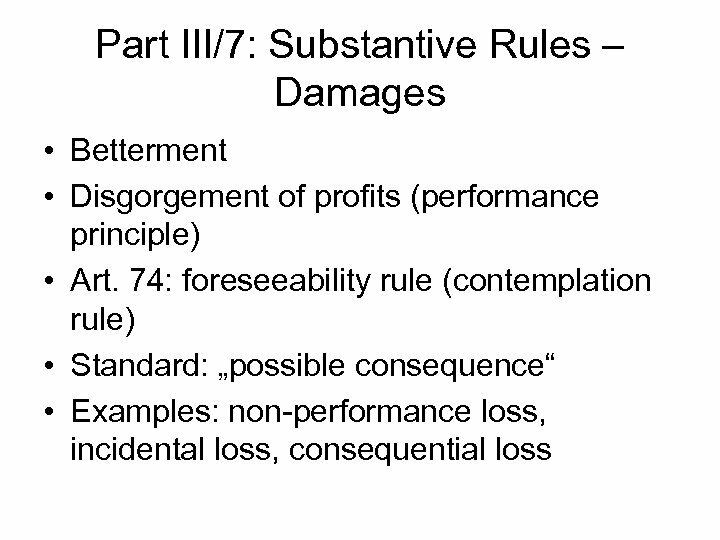 76: abstract: market-price-rule • Abstract calculation of other losses, esp. 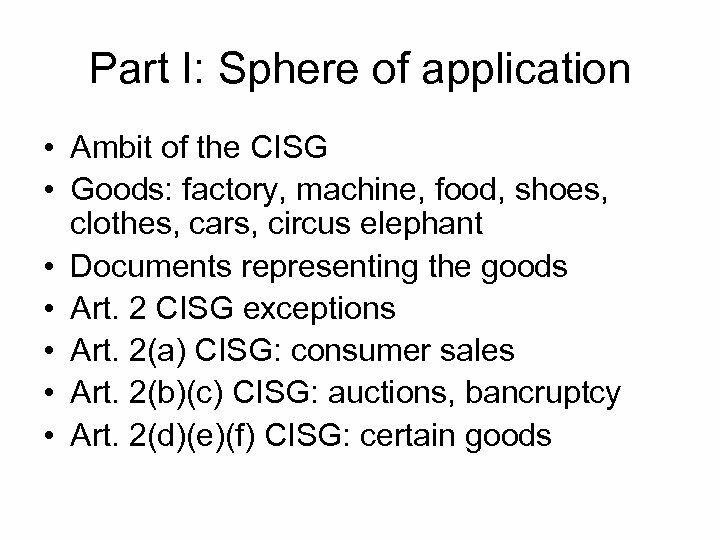 loss of use? 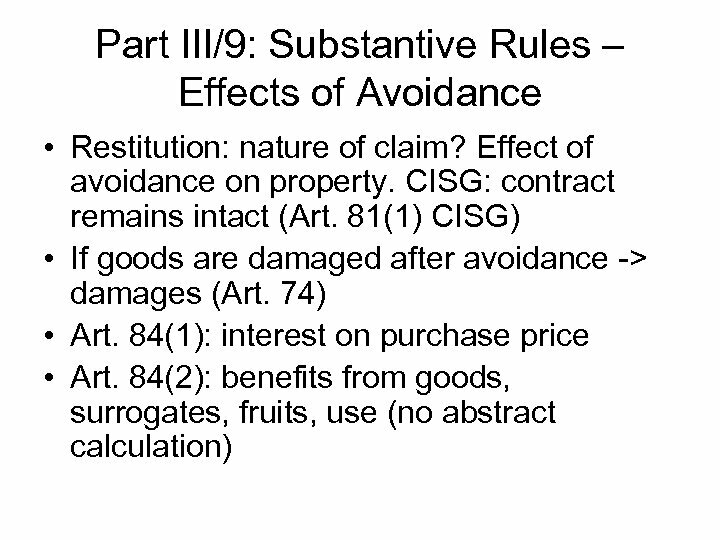 Part III/8: Substantive Rules – Interest • • Art. 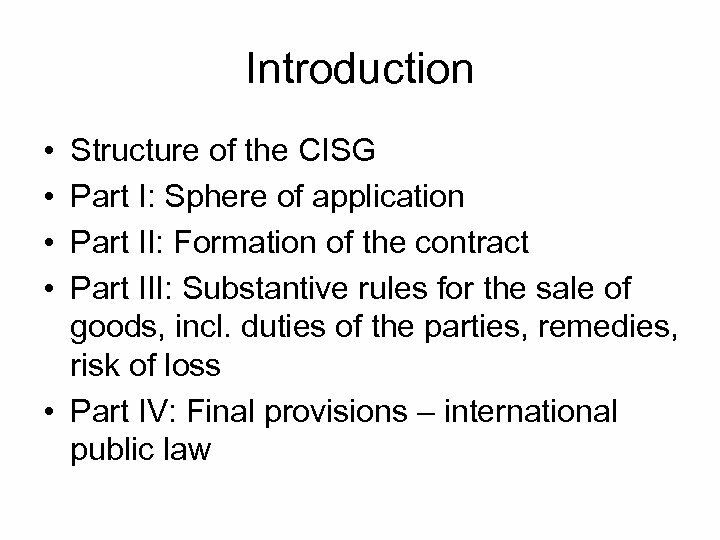 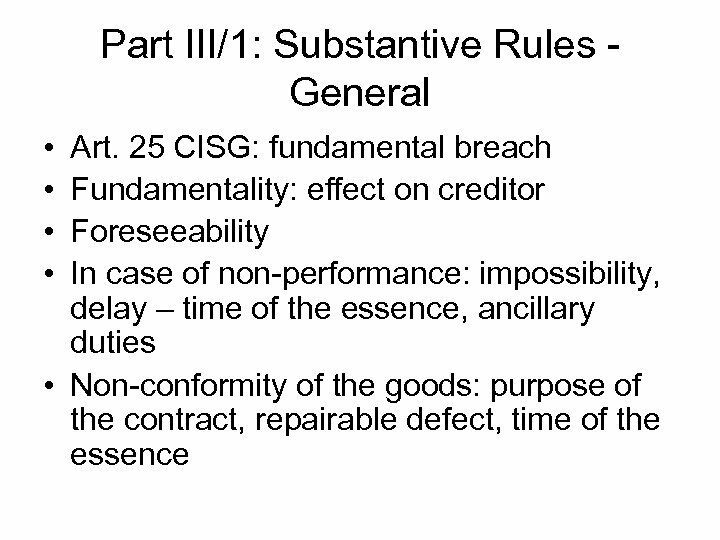 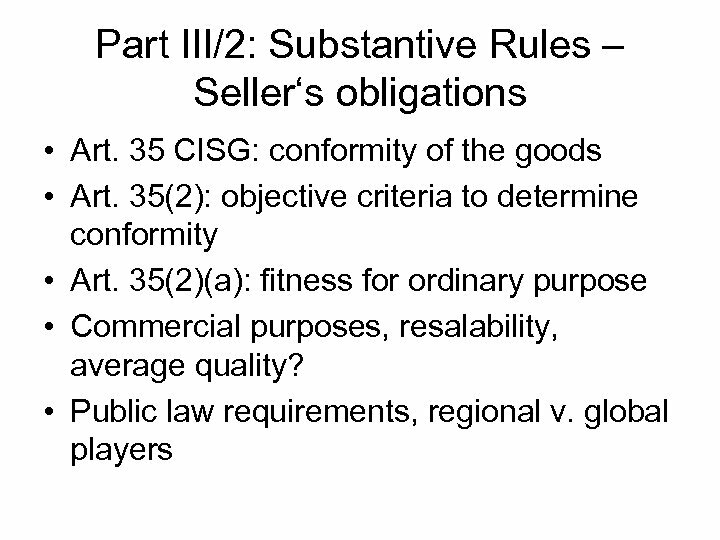 78: price or any sum in arrears Highly controversial, Islamic countries Preconditions: sum due Interest rate: CISG itself? 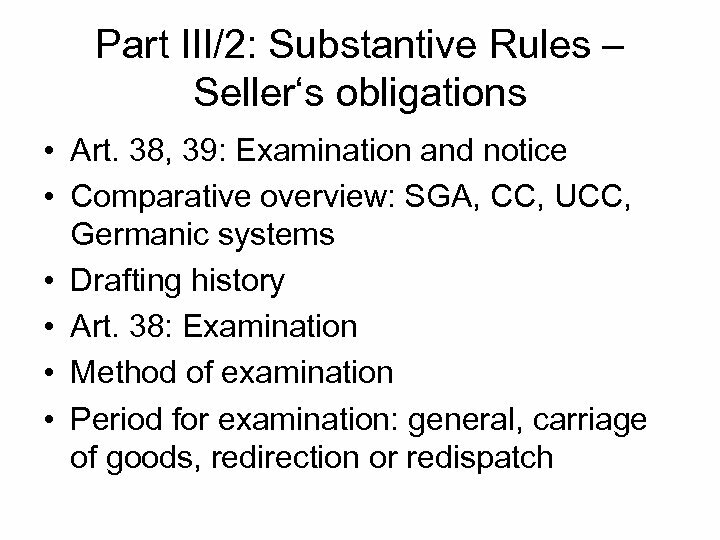 PICC? 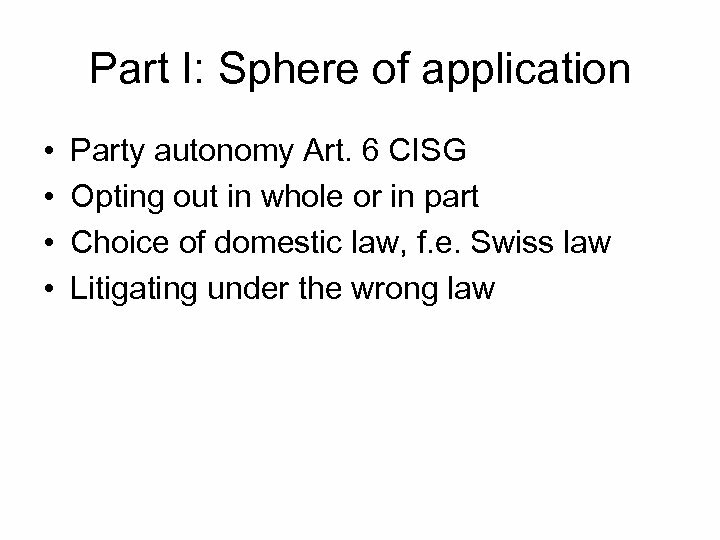 Domestic law? 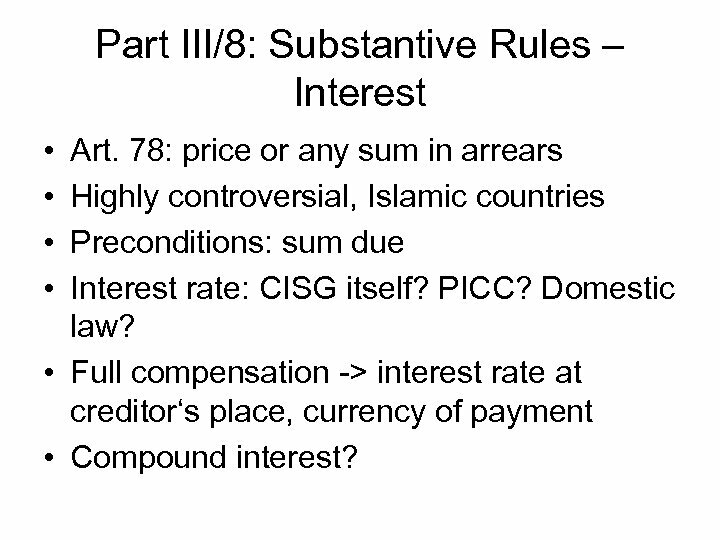 • Full compensation -> interest rate at creditor‘s place, currency of payment • Compound interest?